Two seemingly innocuous requirements for building enclosure assemblies bedevil builders and designers almost endlessly: keep water vapor out, let the water vapor out if it gets in. It gets complicated because, sometimes, the best strategies to keep water vapor out also trap water vapor in. It gets complicated because, sometimes, the best strategies to keep water vapor out also trap water vapor in. This can be a real problem if the assemblies start out wet because of rain or the use of wet materials (wet framing, concrete, masonry or damp spray cellulose, fiberglass or rock wool cavity insulation). It gets even more complicated because of climate. In general, water vapor moves from the warm side of building assemblies to the cold side of building assemblies. This means we need different strategies for different climates. We also have to take into account differences between summer and winter. The good news is that water vapor moves only two ways - vapor diffusion and air transport. If we understand the two ways, and know where we are (climate zone) we can solve the problem. The bad news is that techniques that are effective at controlling vapor diffusion can be ineffective at controlling air transported moisture, and vice versa. Building assemblies, regardless of climate zone, need to control the migration of moisture as a result of both vapor diffusion and air transport. Techniques that are effective in controlling vapor diffusion can be very different from those that control air transported moisture. Vapor diffusion is the movement of moisture in the vapor state through a material as a result of a vapor pressure difference (concentration gradient) or a temperature difference (thermal gradient). It is often confused with the movement of moisture in the vapor state into building assemblies as a result of air movement. Vapor diffusion moves moisture from an area of higher vapor pressure to an area of lower vapor pressure as well as from the warm side of an assembly to the cold side. Air transport of moisture will move moisture from an area of higher air pressure to an area of lower air pressure if moisture is contained in the moving air (Figure 1). Vapor pressure is directly related to the concentration of moisture at a specific location. It also refers to the density of water molecules in air. For example, a cubic foot of air containing 2 trillion molecules of water in the vapor state has a higher vapor pressure (or higher water vapor density) than a cubic foot of air containing 1 trillion molecules of water in the vapor state. Moisture will migrate by diffusion from where there is more moisture to where there is less. Hence, moisture in the vapor state migrates by diffusion from areas of higher vapor pressure to areas of lower vapor pressure. Moisture in the vapor state also moves from the warm side of an assembly to the cold side of an assembly. This type of moisture transport is called thermally driven diffusion. The second law of thermodynamics governs the exchange of energy and can be used to explain the concept of both vapor pressure driven diffusion and thermally driven diffusion. The movement of moisture from an area of higher vapor pressure to an area of lower vapor pressure as well as from the warm side of an assembly to the cold side of an assembly is a minimization of available "system" energy (or an increase in entropy). When temperature differences become large, water vapor can condense on cold surfaces. When condensation occurs, water vapor is removed from the air and converted to liquid moisture on the surface resulting in a reduction in water vapor density in the air near the cold surface (i.e. a lower vapor pressure). These cold surfaces now act as "dehumidifiers" pulling more moisture towards them. Vapor diffusion and air transport of water vapor act independently of one another. Vapor diffusion will transport moisture through materials and assemblies in the absence of an air pressure difference if a vapor pressure or temperature difference exists. Furthermore, vapor diffusion will transport moisture in the opposite direction of small air pressure differences, if an opposing vapor pressure or temperature difference exists. For example, in a hot-humid climate, the exterior is typically at a high vapor pressure and high temperature during the summer. In addition, it is common for an interior air conditioned space to be maintained at a cool temperature and at a low vapor pressure through the dehumidification characteristics of the air conditioning system. This causes vapor diffusion to move water vapor from the exterior towards the interior. This will occur even if the interior conditioned space is maintained at a higher air pressure (a pressurized enclosure) relative to the exterior (Figure 2). The function of a vapor retarder is to control the entry of water vapor into building assemblies by the mechanism of vapor diffusion. The vapor retarder may be required to control the diffusion entry of water vapor into building assemblies from the interior of a building, from the exterior of a building or from both the interior and exterior. Vapor retarders should not be confused with air barriers whose function is to control the movement of air through building assemblies. In some instances, air barrier systems may also have specific material properties which also allow them to perform as vapor retarders. For example, a rubber membrane on the exterior of a masonry wall installed in a continuous manner is a very effective air barrier. The physical properties of rubber also give it the characteristics of a vapor retarder; in fact, it can be considered a vapor "barrier." Similarly, a continuous, sealed polyethylene ground cover installed in an unvented, conditioned crawlspace acts as both an air barrier and a vapor retarder; and, in this case, it is also a vapor "barrier." The opposite situation is also common. For example, a building paper or a housewrap installed in a continuous manner can be a very effective air barrier. However, the physical properties of most building papers and housewraps (they are vapor permeable - they “breathe”) do not allow them to act as effective vapor retarders. The key physical property which distinguishes vapor retarders from other materials, is permeability to water vapor. Materials which retard water vapor flow are said to be impermeable. Materials which allow water vapor to pass through them are said to be permeable. However, there are degrees of impermeability and permeability and the classification of materials typically is quite arbitrary. Furthermore, under changing conditions, some materials that initially are “impermeable,” can become “permeable.” Hygroscopic materials change their permeability characteristics as relative humidity increases. For example, plywood sheathing under typical conditions is relatively impermeable. However, once plywood becomes wet, it can become relatively permeable. As a result we tend to refer to plywood as a vapor semi-permeable material. Non-hygroscopic materials such as polyethylene or plastic housewraps do not change their permeability as a function of relative humidity. The unit of measurement typically used in characterizing permeability is a “perm.” Many building codes define a vapor retarder as a material that has a permeability of one perm or less as tested under dry cup test method. Materials are typically tested in two ways to determine permeability: dry cup testing and wet cup testing. Some confusion occurs when considering the difference between wet cup perm ratings and dry cup perm ratings. A wet cup test is conducted with 50 percent relative humidity maintained on one side of the test sample and 100 percent relative humidity maintained on the other side of the test sample. A dry cup test is conducted with 0 percent relative humidity maintained on one side of the test sample and 50 percent relative humidity maintained on the other side of the test sample. Different values are typical between the two tests for materials that absorb and adsorb water — materials that are hygroscopic. As the quantity of adsorbed water on the surface of hygroscopic materials increases, the vapor permeability of the materials also increases. In other words, for hygroscopic materials, the vapor permeability goes up as the relative humidity goes up. In general, for hygroscopic materials, the wet cup test provides perm ratings many times the dry cup test values. For non-hygroscopic materials, materials that are hydrophobic, there is typically no difference between wet cup and dry cup test results. For plywood, a hygroscopic material, a dry cup permeability of 0.5 perms is common. However, as the plywood gets wet, it "breathes" and wet cup permeabilities of 3 perms or higher are common. traditional hard-coat stucco applied over building paper and OSB sheathing. 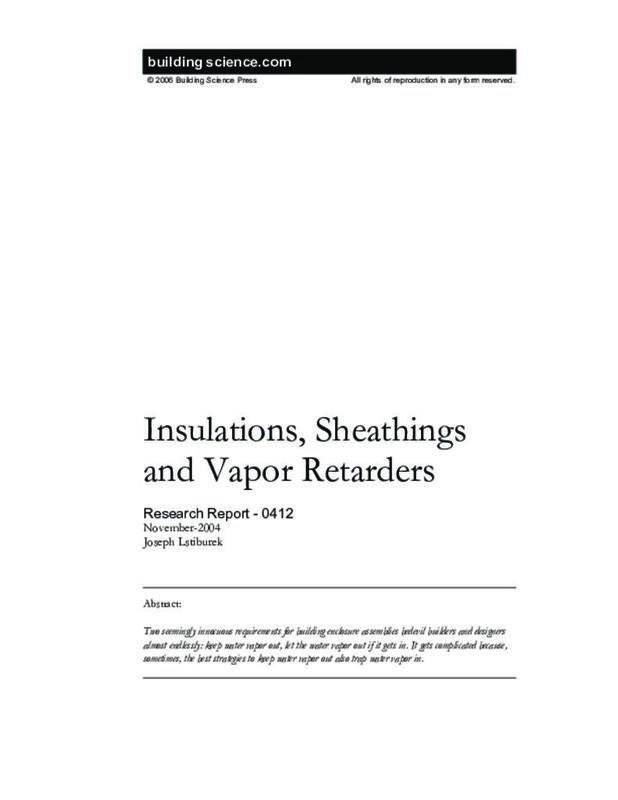 Depending on the specific assembly design, construction and climate, all of these materials may or may not be considered to act as vapor retarders. Typically, these materials are considered to be more vapor permeable than vapor impermeable. Again, however, the classifications tend to be quite arbitrary. . .